You have the ability to create custom price triggers. These will automatically discount the customer when certain criteria is met. In the Store Features section, select Custom Price Triggers. You will then be given the choice to either modify shipping price triggers or subtotal triggers. Select the one you wish to implement, and then see the sections below for instructions on each of these choices. This will modify the subtotal of the order, based on triggers you set up. Next to 'When the' you can select the parameter that would trigger the custom subtotal. 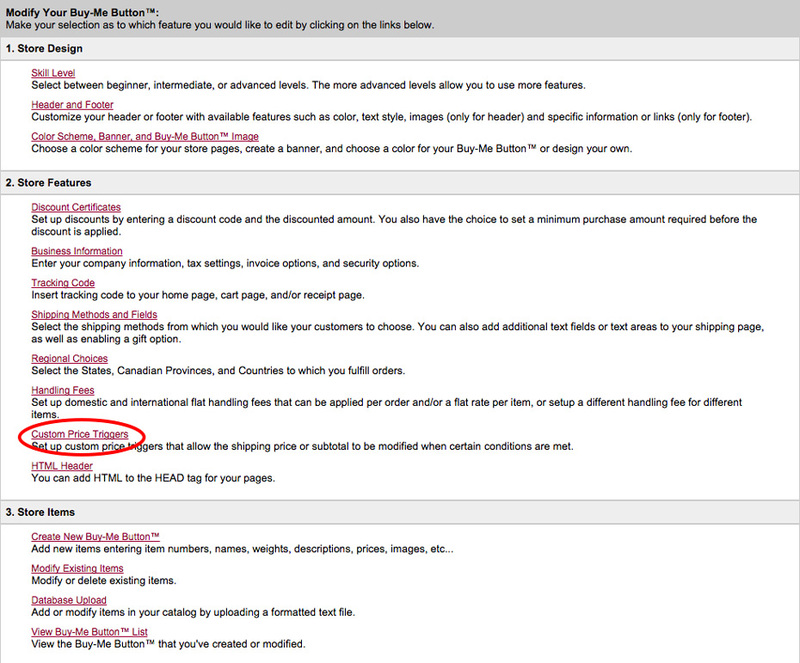 For instance if you select subtotal, the custom price will be applied for the specified subtotal. In the example above, customers will receive 20% off their order when the subtotal is greater than $100. Next to 'is between', enter the range for your custom price in the 2 text fields. Click Add a clause if you would like to add a secondary trigger. For example, if the 20% off $100 above only applies to items in the USA, you may add a clause designating that it only applies to orders shipping in the USA. At the bottom of the page, you have the option to either return to the custom price triggers home page or go back to the Buy-Me Button modification page. If you are finished configuring Custom Price triggers, select Click here to continue modifying your Buy-Me Button. If you'd like to add a shipping-based price trigger, select Click here to return to the Custom Price Triggers home page. This will modify the shipping price of the order, based on triggers you set up. These can be configured differently for each shipping method. At the bottom of the page, you have the option to either return to the custom price triggers home page or go back to the Buy-Me Button modification page. If you are finished configuring Custom Price triggers, select Click here to continue modifying your Buy-Me Button. If you'd like to add a subtotal-based price trigger, select Click here to return to the Custom Price Triggers home page.